A man ordered Eggs Benedict at a cafe. He got served this instead. When Thomas ordered Eggs Benedict at a cafe, he was served this "monstrosity" instead. We’re pretty sure we’ve found the worst Eggs Benedict ever. When diner Thomas Hesketh ordered a serving of the breakfast staple at a UK supermarket, he was met with what he described as a “monstrosity”. Instead of receiving a typical serving of Eggs Benedict – think an English muffin, poached egg, bacon or ham and some hollandaise sauce – Thomas received something very, very different. 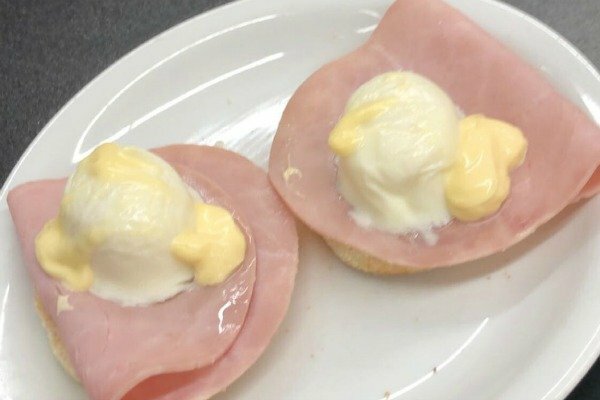 The irritated customer shared a photo of his meal, which consisted of two poached eggs sitting on top of two slices of deli ham and topped with two congealed dollops of hollandaise sauce. “Ordered Eggs Benedict in your Wigan cafe and received this monstrosity instead,” he wrote on Twitter. Yep, it certainly doesn’t look very appetising. The supermarket chain soon responded to Thomas’ tweet, asking whether he told the cafe staff in store. “Hi there, I’m very sorry about this happening. Did you tell the Cafe staff?” a representative for the cafe asked. Yes, they said they could cook me up another one but it would be the same. Thomas, who claims to have paid AUD$8.95 for his breakfast, told the Liverpool Echo that he’ll “never return” to the Tesco cafe again. “I have never been there for food before, I was nipping in for a few bits before work and just realised they had a cafe,” he told the publication. Thomas’ breakfast fail has since gone viral on Twitter, receiving over 20,000 likes and over 3,000 retweets. Hundreds of people have also responded to the post. Omg tom??????????? ?this has to be the most vile thing I’ve ever seen !!!???????? Wonders what @GordonRamsay thinks about these eggs bendict!! ??????? ?